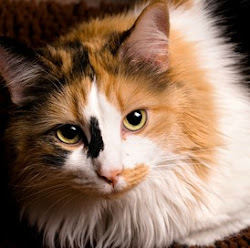 Thomasina's Purrls Of Wisdom About Cats: How Do Cats Know What Time It Is? 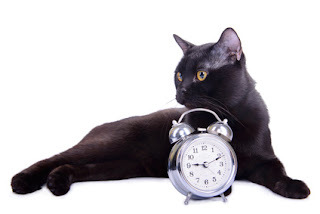 How Do Cats Know What Time It Is? How do cats know what time it is? My indoor/outdoor cat comes in every night promptly at 10 pm. If I open the door a bit early, he's not there. But if I'm a few minutes late, he's annoyed because he had to wait. Does he really know what time it is? 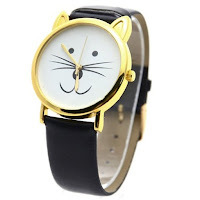 Cats know what time it is, although we don't think of it the way you do. You look at time in minutes and hours. We see it in intervals. Our sense of time is based on circadian rhythms (On what??? My human typist stuck that in there) that pretty much control our internal clocks. Those clocks tell us when one interval (being outside) should end and another (going in for a nap) should begin. It sounds like your cat's clock is set to tell him to go inside at 10 pm your time. Of course, he might decide to reset the clock, depending on the weather. So don't be surprised if his schedule changes with the seasons. In addition to those little internal clocks that tell us when to move on to something else, we can also figure out the time by the position of the sun or moon in the sky and the length of shadows. Inside, our people give us cues so we know what time it is, too. If your cat sleeps with you, he probably knows when you're about to wake up. When he hears you reaching for your keys, he knows it's time for you to leave for work. Scientists think scent can help cats know what time it is, too. When you leave in the morning, the scent you leave in the house smells very strong to your cat. It fades during the day, and when it reaches a certain point, he might know it's almost time for you to come home. Cats are creatures of habit, and most of us like to do the same thing at about the same time and for about the same amount of time every day. You can help your cat keep track of time and not stress over disruptions in his life if you respect his routine and try to do the things you do together at about the same time every day. And if you're not going to be home at 10 to let him in, let him know in advance. If you tell him you'll be an hour or two late, he'll find something to do until you get there and won't yell at you for not opening the door on time.